The mandolin is a stringed instrument in the lute family, usually with four sets or “courses” of two strings each for a total of eight strings. 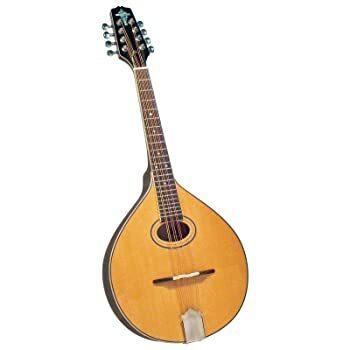 A descendent of the first chordophones, which appeared sometime around 2000 BCE, today’s mandolin is a larger version of an early Italian instrument called a mandolina, which appeared sometime between the 17th and 18th centuries. While early mandolins were plucked with the player’s fingers, modern versions are often played with a pick or plectrum. A number of styles exist including flat-backed, carved-top, and round-backed (Neapolitan). Each body style offers a unique sound, which partly depends on tuning and the number of courses; some mandolins have five courses, and some have six. Our Top choice is the Hola! A Style Mandolin HM-3TS. It’s a great choice for beginners and intermediate players. Besides different body styles, mandolins come with different types of sound holes. Some are round or oval, others are shaped like teardrops, and still others feature decorative covers. Some mandolins have f-holes similar to those seen on violins and cellos. Tuning machines and a tailpiece attach the strings (usually metal) to the instrument. A floating bridge held in place via the tension of the strings provides elevation and allows the soundboard to vibrate. Thanks to its warm, mellow tone, the mandolin is popular worldwide, particularly in art/classical, jazz, bluegrass, Celtic, country, and folk genres. Recent history has seen the instrument used in rock, and Tim Brennan of the Dropkick Murpheys famously employs it in punk rock arrangements. Young artists worldwide enjoy the mandolin’s ability to add unique sound to their music, and as the instrument is fairly easy to play, it is popular with new musicians. Mandolin prices range from below $100 to over $10,000, with plenty of moderately-priced instruments in between. We have reviewed a few different types of mandolins here, skipping poorly-rated models and highlighting the best-rated low and moderately-priced instruments. Overall, the Kentucky KM-150 is best-rated for its ability to appeal to a variety of players from beginner to advanced. With a glossy sunburst finish covering its maple top, back, sides, and neck, the Hola! HM-3TS A-Style Mandolin features an adjustable compensated Rosewood bridge, an adjustable truss rod, and a simple pickguard of black ABS. White body binding and chrome-plated open gear tuning machines provide contrast, while the chrome-plated tailpiece is beautifully ornamented with fine engraving. The neck is of maple, and the fingerboard is of walnut. Strap pins make a useful addition to this traditional mandolin. I love the way this mandolin sounds and if you are a beginner, I think you will, too. She’s a beauty of a mandolin! Great craftsmanship and great sound. Wonderful purchase. Who will Appreciate this Mandolin? Beginners in search of a mandolin under $100 are likely to appreciate the HM-3TS A style mandolin from Hola! Music. 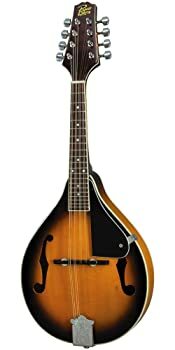 A well-known manufacturer with a good reputation for building decent, playable, low-cost instruments, the company caters to new players with reasonable prices, good materials, and useful features that aren’t often found on entry-level mandolins. While this instrument is not likely to satisfy an expert, it will encourage beginners to practice their way to the next level. With a solid spruce top, solid maple back, solid maple sides, and a classic F shape, the Gretsch G9350 Park Avenue features a Fishman M300 “Nashville” mandolin pickup for amplified electric playing. Its vintage V neck is constructed of maple, and vintage snowflake inlays adorn its rosewood fretboard. An ebony bridge, engraved tailpiece, bone nut, and open-back geared tuning machines impart a look and feel of quality, while a vintage-inspired antique semi-gloss finish and contrasting rosette lend a timeless appearance. One of the loudest (acoustically) F4 bodystyle mandolins I have ever played. The tone is sweet and smoothe all across the tonal spectrum – nice surprising woofy low-end bark, and a mellow, clear high end using D’Addario J74 strings. Overall, I am extremely pleased and so are my audiences. I have gotten many comments on the great, natural sound, both plugged and unplugged, and fellow bandmates and musicians have also remarked on the quality and sound. An outstanding choice for performers in search of a quality mandolin under $1,000, the Gretsch G9350 Park Avenue is sure to please any serious player. Intermediate players and beginners who want the flexibility that comes with an acoustic/electric mandolin will also appreciate this instrument; it’s one that is a pleasure to play, and that will encourage any musician to grow and further explore his or her talent. The M50BS Ibanez mandolin features an A-style mahogany neck, mahogany back and sides, and a spruce top. The die-cast tuning machines are chrome plated, as is the lightly ornamented tailpiece. The dark violin finish offers a rich, cocoa color, which is beautifully complemented by classic white binding. Pearl dot inlay adorns the fingerboard, and F-shaped sound holes complete the look. Stock strings feel rough, some reports of oxidization; many reviewers recommend replacing immediately with D’Addario J74 strings or similar. This mandolin is great for the cost. It had some issues when it was received, but a new set of strings and a professional setup created a great-sounding instrument. Great for bluegrass or rock! Very pretty, cosmetics as well as sound. I enjoy staring at it as much as I do playing it! While the Ibanez M510DVS Mandolin is at its best after being professionally set up, it is a great choice for beginners who are looking for a solid instrument that will take them into the intermediate range and beyond. Intermediate players who are ready to step into a nicer instrument will probably appreciate this mandolin, too. With a solid top of German spruce for crisp articulation, the Kentucky KM-150 mandolin features a solid maple back and sides. The maple neck is designed for easy, comfortable playing, and a choice tonewood fingerboard offers a smooth feel. A high-gloss sunburst finish and F-shaped soundholes combine with a snakehead-shaped peghead to provide a traditional appearance. The adjustable bridge is of tonewood, and open-geared tuners contribute to accuracy and beautiful intonation. Professional setup is recommended. This is a great-sounding instrument and by far the best value out there. I have received several positive comments. Compared with the Rogue I started out with last year, this instrument was more than worth the money I spent. I haven’t been able to put it down since I got it. While the KM-150 Kentucky mandolin is priced a little higher than some other entry-level mandolins, it’s an excellent choice for beginners who are looking for an instrument that they can enjoy playing for several years as they hone their skills. Intermediate players and skilled hobbyists are almost certain to appreciate this mandolin too, particularly when budget rules out a more expensive one. With a solid top of carved Sitka spruce for a bright tone, the KM-256 Artist A Model Kentucky mandolin offers a solid maple back and solid maple sides. Its neck is also of solid maple, and its fingerboard is crafted of choice East Indian rosewood for a smooth, pleasant feel. With a high-gloss finish of transparent brown lacquer, this vintage-inspired mandolin features F-shaped soundholes and contrasting white body binding. Period-correct black and white ABS binding surrounds the pickguard, and all attachment hardware offers vintage-inspired styling. The nickel-plated tailpiece features a cover plate and a leather insert. A bone nut, adjustable rosewood bridge, and high-quality tuning machines make the instrument complete. The KM-250 was recommended by a Luthier as an instrument that I would need to spend an additional $1500 to purchase a different mandolin with appreciably higher quality. He was not wrong! This Kentucky mandolin was a gift for my daughter who takes lessons from a professional bluegrass musician. This is the same manufacturer as his own mandolin; he was very impressed with the quality of construction and tone. Great value. Despite the fact that its price is lower than some similarly fitted mandolins, the Kentucky KM-256 pleases intermediate and beginning players alike. An outstanding choice for serious students, this mandolin will easily carry you from beginner tunes to advanced musical stylings. With a solid spruce top, solid maple back and sides, and a solid maple neck, this beautiful Luna mandolin features a Celtic trinity knot soundhole in contrasting rosewood and mother of pearl inlay. A tobacco burst finish and faux tortoise binding add to its unique appearance. The fretboard and bridge are of black walnut. The Olympia strings are tightened via open tuners fitted with black knobs. 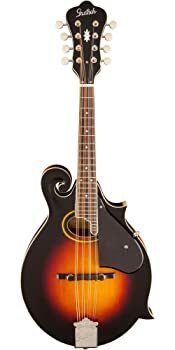 Perfect mandolin for the next step up above beginners. It’s a quality instrument that exceeded my expectations. Anyone who appreciates Celtic knotwork or plans to play Celtic mandolin music will appreciate the Luna Folk Series mandolin for its pleasing aesthetics. Its sound, craftsmanship, and playability make it a good choice for intermediate players, as well as for beginners who are willing to spend a little more on a nice mid-level instrument. The Rogue RM-100A A-Style mandolin offers a beautiful sunburst finish, but that’s only the beginning. This lovely instrument features chrome tuners and nickel-plated frets, along with an adjustable bridge that allows players to get the desired level of action. A flat back and F-shaped sound holes add to its classic visual appeal. Stock strings are not the best; recommend changing them out for D’Addario or another quality brand. I was impressed with the feel and balance. It has a good, solid feel to it, not too heavy or too light, and the neck is very fast. The tuners are adequate, though not superb, still better quality than I expected at this price. This is an amazing instrument for the money. I wanted to teach my kids, so I bought one as a low risk instrument. Out of the box, the action was high, the intonation very poor. Setup is an absolute must; it became a different instrument afterward, with spot-on intonation and OK action. Highly recommend as a first mandolin. As an entry-level mandolin, the Rogue RM-100A is best for beginners on very tight budgets. It’s a great choice for someone who isn’t sure that the mandolin is the right instrument for them, and who wants to experiment. Since the price is so low it’s also a fun instrument to take along camping or to the beach without worrying over potential damage. With a solid, hand-carved fully graduated spruce top, The Loar LM-520-VS Performer is a classic F-style mandolin. Its back and sides are of solid, hand-carved maple, and its maple neck features a rounded V profile. The body, neck, and rosewood fretboard are accented with white binding that contrasts with the sunburst finish, and the compensated ebony bridge is adjustable. Vintage-style Grover tuning machines ensure excellent intonation and assure that the mandolin stays in tune even with heavy playing. A stunning carved headstock makes this handsome instrument complete. This is a great instrument. Looks very nice, sounds really great, sets up well. It did need set up out of the box, but that’s expected. This will work for anyone who can’t buy a custom tier instrument with the proceeds from performing. There are fancier mandolins out there, but I have always been one to admire the beauty of simplicity. For the money, I do not believe you can beat this mandolin! Intermediate players who are ready to upgrade their and take their musicianship to the next level will certainly appreciate everything about The Loar mandolin. Seasoned players who rely on quality instruments for live and recorded performances are likely to enjoy this hand carved mandolin, too. With an all-solid traditional flat body of solid maple, the Trinity College TM-325 Standard Celtic octave mandolin features a solid spruce top for a rich, beautiful sound. The neck is of mahogany, while the fingerboard is of smooth rosewood. An inlaid rosette surrounds the soundhole, and mother of pearl snowflake dot markers contrast with the fingerboard. The peghead features a beautifully iridescent abalone Celtic Cross inlay. With contrasting white ABS and ivoroid binding, it features a bone nut, deluxe geared tuning machines, a two-way adjustable truss rod, and an adjustable bridge of polished Indian rosewood. The instrument was easy to set up and tune, and the finish quality is high. I swapped the light-gauge strings for medium-gauge D’Addarios and love the rich tone. This is a very well-made instrument for the money and more than likely the best for the price range. At the end of the day, after professional setup, you will be very happy with this mandolin. Although beginners might find its price to be prohibitive, the Trinity College Celtic octave mandolin makes an outstanding addition to any dedicated musician’s collection. Ideal for those who play Celtic, folk, and other genres, it is a very nice step up from an introductory-level mandolin, with simple yet visually attractive features and quality construction alike. With a nato neck and basswood top, back, and sides, the Stagg M20-LH bluegrass mandolin is built with the comfort of left-handed players in mind. A rosewood fingerboard offers a smooth feel, while F-shaped soundholes and a beautifully engraved nickel tailpiece impart a classic appearance. The bridge is of black-stained maple, and is adjustable. Open-gear nickel tuning machines and white binding contrast perfectly with the violinburst finish. The tone of this model is better than expected at this price, still not professional-grade. If you’re looking for something to play casually around the house, this is a great buy! if you’re looking for something to play at shows or add to your studio collection, consider upgrading. Left-handed mandolins for beginners: They’re a bit difficult to find. A new to intermediate lefty will certainly appreciate the Stagg left-handed mandolin for its affordability, playability, and pleasant intonation. This instrument will help you determine whether mandolin is a good choice for your taste, and will easily carry you to the next level without representing much of an investment. Shopping for a mandolin can be a tricky business, particularly with the sheer volume of instruments available online and the limited number available at music shops. Factors such as affordability and quality come to mind first and foremost; they’re among the key considerations when buying a mandolin. 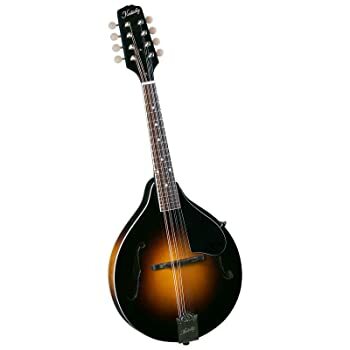 Cost: While it is true that there are quite a few mandolins under $100, it’s also true that the majority are meant for absolute beginners, and most are not well-built. 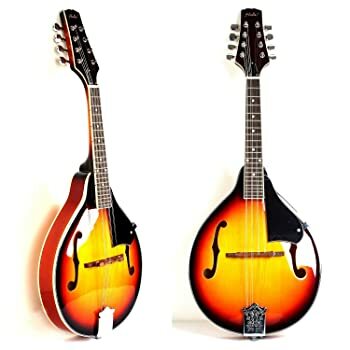 Mandolin reviews on most instruments that fall into this particular category reveal unhappy, frustrated buyers who quickly recognize that the old adage “you get what you pay for” is true. We managed to find a few decent mandolins under $100, all designed to help beginners get off to a good start. 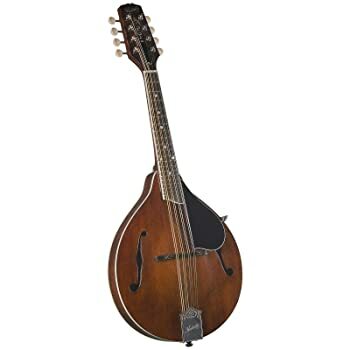 If at all possible though, save up and look at mandolins in the $200-$500 price range. There are many to choose from, and most of these will keep you playing for years. If you’d like to play for an audience now or in the future, consider a better mandolin. You don’t have to spring for a custom instrument just yet; in fact, there are several mandolins under $1000 which will make you and your audiences very happy. Components: Look for things like geared tuners, an adjustable bridge, a truss rod, and a solid wood top. Don’t worry too much when reviewers complain about strings; these are easy to replace and most low- to mid-range mandolins benefit greatly when you add a nice set of strings. Acoustic vs. Electric: Most players choose acoustic mandolins, while others opt for acoustic/electric models. If you need amplification, then an acoustic/electric may be the best way to go: You’ll never have to worry about feedback from a mic, and you’ll be able to move more freely onstage. It is possible to electrify an acoustic mandolin if you like; a professional luthier can do the job for you. Note: If bridge is in place when it arrives, there’s probably protective plastic underneath and that will need to be removed. You can learn how to position your mandolin’s bridge with online tutorials found on YouTube, or you can take it to a local guitar shop for setup. You want to be able to enjoy your mandolin! It’s best to get one that appeals to your taste and meets your needs while also satisfying your budget. 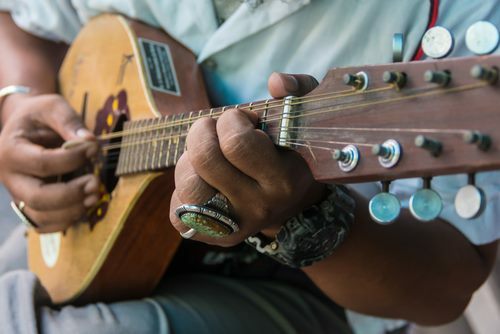 With these points in mind, we hope you enjoy the unique sound of the mandolin as well as all the fun and relaxation that comes with making music on your own or with others. Best wishes on your next musical adventure!